Every serious student of the Bible desires to understand the text, discover the biblical principles, and apply the truths to his/her life. 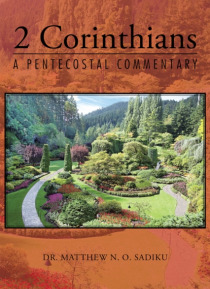 This commentary is designed to help students, pastors, and Bible teachers understand 2 Corinthians in a simple manner. Working from the popular New International Version (NIV), the author provides helpful commentary on the text verse-by-verse. This verse-… by-verse commentary is different from others in two respects. First, it is brief while some commentaries are unnecessarily wordy and verbose. Second, it is Pentecostal in outlook. This implies that we generally adhere to the doctrine of biblical inerrancy and adopt a literalist approach to the interpretation of the Bible. Second Corinthians has been described as the most autobiographical epistle Paul ever wrote. At Corinth, Pauls ministry was under fire and he was forced to defend himself. Here we see Paul as Paul. The epistle is thus an apologetic letter. The message of 2 Corinthians is relevant for Christian life today.